Finding water in the basement is more than just a big, wet mess; left alone, it can cause your home’s foundation to weaken and breed harmful mold and mildew. Once the water has been cleaned up, it’s vital to find the source and fix it as soon as possible. These four are among the most common sources of basement flooding. Leaky pipes/hoses. Unless the entire basement is flooded, you should be able to trace the water back to the source. Washers, water heaters, and water softeners all use water and can make a big mess if they leak. Check hoses to make sure they’re not cracked or need to be tightened. Cracks in windows, walls, foundation, and floors. Water can ooze through the smallest cracks that go unnoticed until a heavy rain. Sealant will prevent water from coming in, and can be installed on minor cracks. Major cracks, especially with the foundation, should be handled by experts. Seal windows, or replace if the damage is too great. Heavy rains. If there’s a soaker and the downspouts aren’t aimed away from your home, all that water can pool around the foundation and end up in the basement. This is why it’s important to keep those gutters clean; overflowing gutters dump rainwater all over, instead of directing it away from the house. This is an inexpensive, but maybe not an easy fix. Make sure the downspouts point away from your home and that the ends haven’t been flattened, and keep the gutters clean. Improper lawn grading. Your home should sit higher than the rest of your lawn, so rainwater will run away from it. If you notice rainwater running towards your home instead, consider having a drainage system installed that will funnel water away from the house. 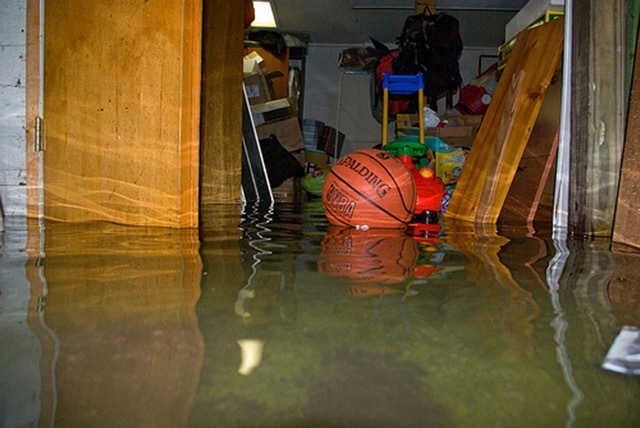 Call the experts at ServiceMaster Recovery Services by TLC if you notice one day that your basement looks more like an indoor lake. They arrive within two hours of your call in the Bridge City, TX and Westlake, LA areas to provide a free estimate and begin to limit the damage. Their technicians use the latest technology to remove water and limit damage from residential and commercial properties and help prevent the growth of mold and mildew. The cost to repair water damage in a basement varies widely, depending on if the area was finished, how long the water sat and how much property was affected. According to Angie’s List, a minor flood with several inches of water could cost $10,000 to clean, while a larger flood could cost between $25-50,000.